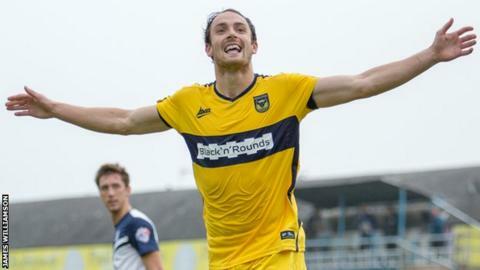 Oxford United striker Danny Hylton praised the team's character after they came from behind to beat Northampton Town at Sixfields. He struck his ninth and 10th goals of the season to help seal victory after they had fallen behind early on. "Fair play to everyone, we didn't let it affect us and won quite comfortably," Hylton told BBC Oxford. The win against former boss Chris Wilder's Cobblers lifted the U's to 19th in the League Two table. The 25-year-old arrived at Oxford in the summer and is now the joint top-scorer in League Two. "I'm delighted to have got to 10 so soon. I'll keep working hard, if I keep getting the opportunities, hopefully I'll still take them," he said. "(I'm) Happy to have won the fans over, Constable was here before and I got reminded every day that he did well for the club, but I am completely different. "I'm delighted I've come in and done what I can do, and I'll keep trying to do that." Manager Michael Appleton revealed after the game that a number of players had been affected by sickness before and during the game. And he admitted a bug sweeping through the squad was a worry ahead of Saturday's game against Carlisle, with the squad due to head north on Friday. "Andy Whing was ill before the game, so to get through the game as he did was fantastic," Appleton said. "Four or five are not too well, so that's a concern ahead of the trip to Carlisle."